​When you cut the cord, and free yourself from the limitations of a monthly cable subscription, it's all too easy to find yourself adrift in an unfamiliar sea of on demand online content. Streaming sites like Netflix and Amazon Prime Video offer a ton of great television shows and movies that you can watch at any time, but what about streaming live television? If you find yourself craving the comfortable familiarity of live television, we've pulled together a list of the eight best TV streaming apps and services. 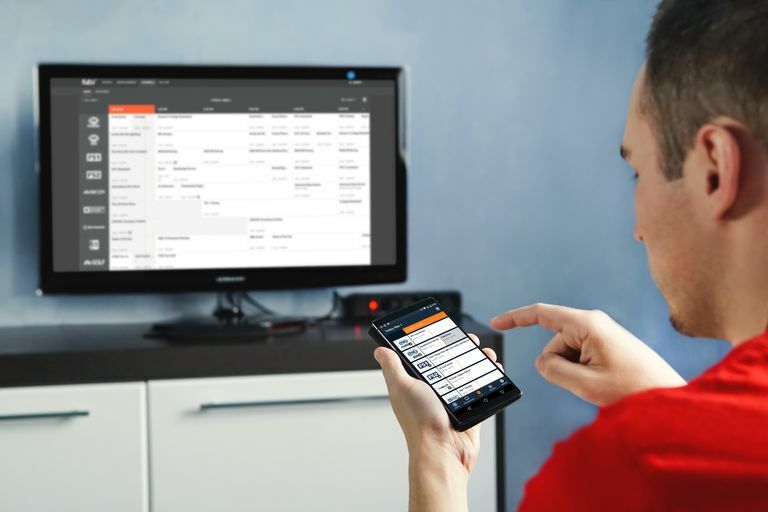 Each of these TV streaming services allow you to stream live TV right in your internet browser, and many of them also work with phones, video game consoles, and other devices. Some are better if you like sports, some offer a dizzying array of channels, and others offer great options for budget-minded cord cutters. Unlimited recording and storage on YouTubeTV's own Cloud DVR. Lots of networks included in the plan. Easy to watch on tablets via a browser or the YouTube TV mobile app. TV requires a streaming device or smart TV. YouTube TV is not available everywhere in the U.S. Some "holes" in programming, no HBO or Discovery Channel. Can't fast-forward through the commercials on some of the recorded content in the Cloud DVR. About $40/mo for 40+ channels. How many shows can you watch at once? YouTube TV offers all the major networks and about 35 additional cable channels, so it's pretty much right in the middle of the road in terms of cost and coverage. One of the big things that YouTube TV has going for it is unlimited digital video recorder (DVR) cloud storage, which means you can record as many shows as you want, and access them from any device, without any extra charges. YouTube TV also includes access to shows like Kobra Kai that are normally only available to YouTube Premium subscribers. Available with an internet connection and a smart device. No set top box needed. Internet connection must be high-speed for streaming. Not as large a channel selection as with cable or satellite TV. Ranges from about $35/mo for 60+ channels to about $70/mo for 120+ channels. DirecTV Now is an online television streaming service that's operated by a company that also provides satellite television, so it should come as no surprise that they offer a ton of channels. If you want a direct replacement for your high-end cable or satellite television subscription, then DirecTV Now is probably the only streaming service that's going to even come close to satisfying you. DirecTV Now is also a good option for AT&T subscribers. In fact, AT&T subscribers are sometimes eligible for certain bonuses, and the only way to rent movies from DirecTV Now is if you have a combined AT&T and DirecTV bill. Watch live TV in many regions. Unlimited cloud saves for 28 days. Doesn't require a PlayStation console. Offers some on-demand and "catch-up" programs. Only viewable in one "home location." Not helpful in discovering new shows. Live network channels aren't available in all areas. Ranges from about $40/mo for 40+ channels to about $75/mo for 90+ channels. Sports package, HBO, Cinemax, Epix, Espanol package, Fox Soccer Plus, Hi-Yah! Vue is a streaming service operated by Sony, so it should come as no surprise that it's the best choice for anyone who wants to use its PlayStation 3 or PlayStation 4 to stream live television. You don't need a PlayStation to use Vue, as the service is also compatible with smartphones and television streaming devices, but it is a great option for anyone who already has a Sony console. Generous selection of live sports and on-demand programming. Covers college, national, and international sports. About $45/mo for 65+ channels. While fuboTV offers a decent selection of live television channels, the real selling point of the service is sports. Most other services offer some sports channels, but fuboTV has some, like GOL TV, that you'll have trouble finding elsewhere. If watching live sports on the internet is your primary goal, then fuboTV is probably going to knock it out of the park. It's also a great choice if you want to watch either Spanish or Portuguese language sports channels. Good selection of national networks. Offers 50-hour Cloud DVR (for extra fee). Little (or no) local programming. Sling TV offers a whole lot of options, so it's a good choice for anyone who is really looking to tailor their experience. The budget-priced Orange plan is one of the less expensive options out there, but the Blue and Orange+Blue plans rival the coverage offered by most of the competition. Sling is also a good choice for anyone who wants access to both sports and general entertainment channels. The optional sports package adds NHL network, NBA TV and ESPNU, and another optional add-on brings NBA League Pass to the table. Comes with Hulu's entire library of on-demand and original content. Compatible with many platforms and smart devices. Offers fewer channels than its competitors. Extra charges for "no commercials," extended cloud DVR, and unlimited screens. About $40/mo for 50+ channels. Hulu is one of the oldest and most trusted names in the streaming world, but the basic service doesn't include live television. Hulu With Live TV is an additional subscription, above and beyond the regular subscription, that adds access to live television channels. If you're already a long-time Hulu subscriber, then this is a great way to seamlessly add a live television option to a service you already use regularly. Inexpensive live television streaming service. A poor choice for sports fans. Doesn't carry ABC, CBS, NBC, or FOX programming. No way to filter the catalog by genres. Philo is the most affordable multi-channel streaming service that offers live television, but it also has the fewest options and the sparsest lineup. Neither of its plans include either ESPN or Fox Sports, for instance. If you're looking for a cheap way to watch live television online, and Philo has the channels you're looking for, then it's a great choice. Thousands of current and classic CBS show episodes on-demand. Exclusive access to original programming. Live CBS news and NFL games. Includes only two channels: CBS and CBSN. Some shows don't include all episodes. Doesn't support 4K. Content streams at a maximum of 1080p. About $6/mo for two channels. Unlike the other options for watching live television online, CBS All Access doesn't provide a ton of different channels. When you sign up, you get access to CBS and CBSN. The main draw for CBS All Access is that, in addition to providing an online stream of your local CBS channel, it also provides access to a number of exclusive, online-only CBS shows. For instance, the only way to watch Star Trek: Discovery is to sign up for CBS All Access. If you're a fan of a lot of CBS shows, then the inexpensive price tag makes CBS All Access a great deal. If you don't watch a lot of CBS shows, then it's safe to take a pass.